Thanksgiving Day. I've always defined thankfulness as reverence in the face of your own circumstances, but the definition seems lacking in a way I can't quite put a finger on. Some cynic or another once wrote that the more you have, the less likely you are to be thankful for it, and that's not quite right either. We're more likely to be thankful after we've come up short for awhile and then returned to abundance, but there are also people who in their fragile final years are simply thankful to be (as one put it) "still suckin' air." It's probably just one more mystery under the cloud of a culture that doesn't much like mystery. So be it. I'm about to shut this thing down and go over to my sister's for a big Thanksgiving Day dinner among all the scant handful of close relatives that Carol and I have left. I've lost the heart for feasting in recent years, so I probably won't stuff myself, but will simply be glad that there are still a few people left in that core group we call "family." It's been a lousy couple of years in a lot of ways, but there's still abundant potential for reverence when meditating on what I still have: Mind, means, mettle, and (far more than any of that) the woman who will sit beside me, and raise a glass to those who once also sat at this table, and taught us by their example what "blessings" really are. Well, by this time most of my friends (and a few strangers) have weighed in against me on the SUV issue. I think most who sent me SUV fuel-economy statistics missed the point of my recent rant: That the current anti-SUV movement is not about gas mileage at all, but is a petty vendetta mounted by liberal environmentalists against conservatives. I would gladly join in a thoughtful national discussion about fuel economy on today's highwaysbut such a discussion does not exist. Politics, being the shadow cast by original sin on human governance, has poisoned another well. Just as we can no longer talk equitably about race or AIDS or abortion or any of a whole long list of things without descending into hate and name-calling, we can no longer talk about SUVs. I won't bring the matter up here again. Life's too short, as my mother always said. Let me leave you with my thoughts on the larger fuel economy issue. Would suppressing one category of low-efficiency vehicles reduce gas consumption? Probably. But is reducing gas consumption really the point? If so, I have a far better idea: Eliminate the middleman and just ration gas. Eek! But hey, I mean it: Decide how much gas to permit each licensed driver to buy weekly, and figure out a way to enforce it: Smart cards, probably. Issue debit cards calibrated in gallons rather than dollars, and let gas pumps debit the allocation as fuel is purchased. People who use less than their allocation could sell their unused fuel rights on the open market. This was how it was planned to work back in 1973, when we flirted with gas rationing but didn't quite get there. Rationing would directly control gas consumption without dictating what sorts of vehicles people could own. It would factor out all the agendas, and obviate the need to cast moral judgments on people based on what they drive. The rich could have their damned Lincoln Navigators if they really wanted them, and maybe Detroit would engineer something that would let me outrun a wildfire and still get 30 miles per gallon. I'd support that. I doubt too many other people wouldand that's where the real heart of this whole ugly issue lies. At the behest of reader Kyle McAbee I've begun reading Phillip Pullman's His Dark Materials trilogy, which is nominally "YA" (young adults) material, but I could use a good yarn these days, and the SF world has been pretty stale lately. (When I pump so much nonfiction during the day, as I have been recently, I need something to bleed off the waste heat, and a good story does that well for me.) I'm now most of the way through The Golden Compass, and I see that what I have on the other end of the string is a gen-u-wine metaphysical novel, of a sort that people just don't seem to write anymore. So what's a metaphysical novel? As best I can define it, it's a story that treats the natural and supernatural as a seamless system, all the weay up to God Himselfwhich includes, I suppose, things like the appalling "Left Behind" series, but in fact is an honorable category. C. S. Lewis' Space Trilogy falls into that bin, especially the last two titles and double-especially the third, That Hideous Strength. So do all of Charles Williams' novels (which are pretty obscure) and, I am told, David Lindsay's A Voyage to Arcturus, which I have not yet read but intend to. So why doesn't this include fluff fantasy like Harry Potter? Note that I said a seamless systeman organized and coherent, even if imaginary, system of metaphysicswhich Harry simply doesn't have. I don't, in fact, read much fantasy because it's generally a junk-drawer of cheap wonders that don't hang together into a system exhibiting any kind of coherence. Good fantastic fiction, be it SF or fantasy, focuses on characters who struggle against systematicnot randomforces. Randomness, like insanity, is pretty dull. In hard SF, characters often struggle against physics, even if the edges of physics have been imaginally extended. Physics is a metaphysical system in a sense, even though it limits itself to what may be perceived repeatably and unambiguously by the senses. It's still a system. You can posit things like my Hilbert drive (from The Cunning Blood) as long as such things work in a predictable, systematic way. I'll have more to say about metaphysical fiction in the future. For now, it's back to Wi-Fi. A woman of my close acquaintance (who asked to remain nameless) took me to task for bolting a piece of kitchen trash to a piece of garage junk and then forcing Carol to look it it sitting on our livingroom coffee table while I check eBay auctions on my laptop, connected Wi-Fially to my broadband Net connection upstairs. (See my entry for November 17, 2002.) Our livingroom is the most elegant area of our house, she says (and I keep meaning to take elegance lessons so I can be sure if that's true or not) and kitchen trash (in this case, empty beef soup boxes) lack elegance, to put it mildly. She was silent as to whether a spaghetti sauce can exhibits greater elegance than a beef stock box (see October 8, 2002) but my suspicion is that used food containers of any stripe fail the elegance test, at least for livingroom service. Clearly, something will have to be done to dress up the Beef Stock Box Bandwidth Expander. I'm researching options at this time, and will report here when something turns up. I'm a little surprised that so little has been written about the disconnect between bit rate and data throughput in Wi-Fi work. The difference is so awe-inspiring as to suggest something close to fraud. Nominally, bits move through a Wi-Fi connection at 11 Mbps when the link is at its best. This rate drops off as you move further from the access point, or if obstructions and microwave shadows put you into a thin spot or a dead spot. On the other hand, if you measure throughput (the rate at which actual data moves through the link) you're nowhere near 11 Mbps. I see 4-5 Mbps at very best when I test data throughput using the excellent free QCheck utility. The difference happens because a good bit of your throughput is eaten by link logistics and housekeeping. Your data needs to be packetized, and packets are made of bits too, with headers and all kinds of odd little appendages that I don't yet fully understand, even after having studied them for several months. Some vendors have extended the standard Wi-Fi spec with higher rate tricks. TI has a proprietary chip set that uses PBCC (Packet Binary Convolutional Coding; don't ask!) to achieve a best-case bit rate of 22 Mbps. So does that mean you get twice the throughput? Hah. I bought some TI-based gear on sale (the D-Link AirPlus line) and measured throughput with QCheck. 6 Mbps, tops. Better than 4, fersure, but methinks we're getting deep into the zone of diminishing returns here. 70% of your bit rate seems to be devoured just getting your data through the link. Nobody seems to be calling the public's attention to this, so I'll probably have to in my book. Thank God books aren't advertiser-supported, or this "secret" would have to remain a secret. Perhaps it was inevitable: The Greens have enlisted feckless clergy in their escalating jihad against SUVs. There's a new campaign afoot, called "What Would Jesus Drive?" No, I'm not making this up, and yes, they are dead serious. Interestingly, nobody ever says anything about pickup trucks, or Cadillacs, or Lincoln town cars, or heaven knows, Corvettes. I'm quite sure by now that it's not really about gas mileage. It's about a cultural demographic, and an excuse to harass the people the Greens hate the most: The almost-but-not-quite-rich, who are for the most part Republicans and who have the bad karma to enjoy their money without feeling especially guilty about it, as the bona fide rich often do. I'm a little touchy about this, because I myself have an SUV, though not one of the monster models. There's only two ways out of my little dirt-road corner of nowhere, and one of them will not pass a Honda Civic. Having watched a desert wildfire (complete with a 40-foot wall of flame) from the roof of my house in 1995, I reserve the right to drive something that will get me out of here, road or no roadand if ordinary non-dirt-road people were not allowed to own SUVs, they wouldn't exist. So it goes. In the meantime, if you really want to know what Jesus would drive, consider this site. My favorite is "The Apostles were all in one Accord..." Now that's a roomy vehicle! I'm getting into death-march mode on my Wi-Fi book, so if entries here start to get a little sparse, don't give up and stop visiting. I haven't hammered this hard on a book project since I wrote (most) of Borland's 1989 Turbo Pascal OOP Guide in nine (long) days flat. Part of the problem is that the ground keeps shifting under my metaphorical feet, and I've had to rewrite several sections extensively as new standards proposals and other stuff shows up out of nowhere. It'll be a good book, and it'll be done soon, and I'm beginning to ache for the end of the road, as fun as it's been getting this far. Well, no stormbut it was a fine, fine show nonetheless. The problem last year was clouds; the sky was crystal clear this year, but the problem was a full moon. We saw plenty of meteors, but the sky brightness attenuated their appearance, and we probably missed a lot of the fainter ones. There were a fair number of fireballs that brightened and dimmed several times before going out, leaving a lingering trail of incandescent dust behind them. We saw hundreds during the time we spent on the roof, and probably missed twice that many simply because we didn't have eyes in the backs of our heads. With this pass through astronomy's November Country, the Leonids move away from us, and become just ordinary again. I think a lot of people (myself included) will go up on the roof for one last look next year, just in case...but even without seeing hundreds at the same moment, it was an awesome experience. The last time Carol and I made beef barley soup (see my entry for January 26, 2001) I made a point of buying beef stock in a Tetra Brik package. A Tetra Brik is a cardboard box for liquids, kind of like a juice box but lined in aluminum foil rather than simply plastic. I saw somebody on the Web make a Wi-Fi antenna from a Tetra Brik and gave it a shot myself. It took maybe 20 minutes, and I did what cardboard mangling had to be done with a Swiss Army knife. After soldering 1.22" of #12 wire into the solder pot of a silver-plated N female connector, I bolted the N connector to the box with 4-40 screws with spiny lock washers under their heads. The spiny lock washers were crucial, since the foil lining of a Tetra Brik is itself covered with a thin plastic film. The body of the N connector must be in electrical contact with the aluminum foil, so I mashed down hard on the four screws to make sure the spines on the lock washers pierced the plastic film and made contact with the foil. Once my ohmmeter indicated a solid connection, it was done. I mounted it on a scrap of aluminum sheet metal and an old heat sink from a Xerox 660 copier, as shown at left. It works well. 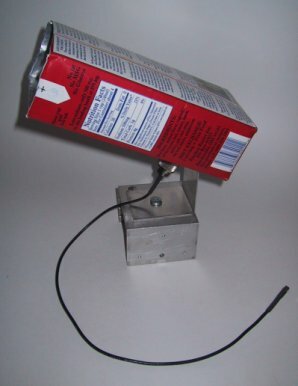 Not quite as well as a tin-can antenna (see my entry for October 8, 2002) but it's smaller, and it still allows me to connect from my living room coffee table at the full Wi-Fi bit rate of 11 Mbps. Tetra Briks are really a European phenom, but you see them here and there in the US, and if you want to try this, you need the 60 mm X 90 mm X 200 mm size. The performance of a waveguide antenna is tightly linked to its size, and smaller or larger boxes may not be electrically compatible with the 2.4 GHz Wi-Fi frequencies. In one feverish hour last night, I put this page together, providing a glimpse at some of the homebrew radio projects I've done over the years. I'm packing up a lot of that stuff right now, and I'm not sure when it will see daylight again, so I took some pictures and got it all formatted and pretty. I have a few more to add, but I ran out of time and energy. With some luck I'll get a few more up before it all goes into boxes. I realize with some chagrin that my engineering notebooks have already been sealed in boxes, with 40 years of QST sitting atop them, so although I'm more than happy to share circuits, they're not, um, convenient right now. I've been fascinated by GPS for years, but it wasn't until recently that I actually popped for a receiver. I'm not a wilderness trekker and really didn't want one of those high-end Garmin thingies with a color screen showing a bad map. I just wanted something that would pump GPS coordinates to my laptop, allowing a mapping package like Streets and Trips to post a "you are here" pointer as I drive. What I chose was the Holux GM-210, shown at left. It's not even as big as a mouse or a cake of soap. It's waterproof, and magnetic on the bottom, so you an stick it to the roof of your car. The thin lead-in terminates in a female DIN connector, and the unit comes with two sets of cables, both of which mate with that DIN connector. 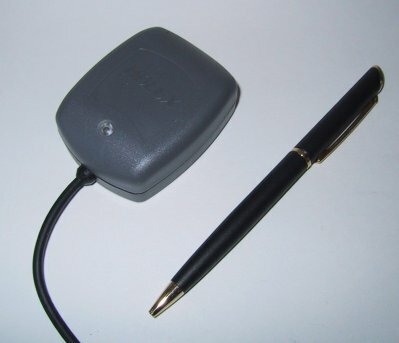 One ends in a simple USB connector, the other forks to a standard serial port 9-pin D connector and a cigarette lighter power plug. This was cool; with USB you can power it right from the connector, which will source as much as half an amp. It struck me as odd that it could switch from COM port to USB port as simply as that, and I soon found that it plays a cool trick: It installs a special USB to COM bridge that communicates with the unit through the USB port but makes the data available on a COM port (your choice which one.) Nice touch. I haven't chosen a map package yet, but I've gone wardriving with NetStumbler and it works beautifully. I got it online, from The GPS Store. $150. I'm still boggling at how small it is. Will I ever be able to take all this magic for granted? Probably notand that, as I see it, is a good thing. It's Comdex season again, and I confess, I miss it a little, even though my friends who still go tell me it isn't worth it. (They go to hang out with all the other journalists who still go even though they think it isn't worth it.) I haven't been in about seven or eight years, but in the period when I attended religiously (1985-1994) I saw a lot of wild stuff and really enjoyed it. So maybe this is the time to tell my one really goofy (and slightly tasteless) Comdex story. It was back around 1989 or 1990, and laptops were still pretty novel, even though they were still all packing 8088's. In one of the large halls, I happened upon a booth owned by a Taiwanese company selling chunky little laptops that were admirably small, but still pretty thick: about the size and shape of a desk dictionary. The booth was fair sized, and pretty expensive looking, with faux marble pillars and leather chairs and things. Atop several of the marble pillars were mounted detached mannikin hands, and resting on the splayed fingertips of the hands were their little laptops. Another quick note, as I'm furiously writing this week... Reader Dennis Skiles pointed me toward Dutch Connection Imports, yet another supplier of European licorice (among many other things) based here and not in Europe. Amazing selection: More international licorice than Licorice International, and prices about the same. They also carry cookies, cheese, coffee, tea, chocolate, gift baskets, and miscellaneous knickknacks. They do indeed have katzen-pfotchen, and plenty of other varieties, most in small bags so I can try them before shelling out for half a pound. Fine stuff. Some of you may have read and enjoyed my SF story, "Drumlin Boiler," which was published in the April 2002 issue of Isaac Asimov's Science Fiction. I discovered today that Asimov's mounts an annual Reader's Choice Award ballot on their Web site. Just thought I'd pass that along, heh. It's embarrassing enough to look at pictures of yourself as a kid, or (in my case, at least) as a younger man. This afternoon, while cleaning out the garage, I was emptying out boxes of old papers, some of them going back to my college years. A lot of it were things I had written, from workshopped science fiction stories from Clarion and after, to a large stack of APAs I'd participated in from 1978-1984. I read a few. It made me groan. An APA (Amateur Press Association) is an interesting and now mostly extinct phenomenon, made obsolete by the newsgroup and message board, and to a lesser extent, the (yekkh, I hate the word) blog. A group of ten or twelve people would write a two or three sheet "zine," run ten or twelve copies at work, and mail them to a central collator, who would then mail the collated and stapled zines to the participants. This happened once a month or so, and the collating job would usually rotate around the group. APAs were not usually "about" anything but the participants and their views of the world and of one another. It was a little like a primordial Web, and I remember it being a lot of fun. That is, I remembered it being fun until I read a few. Egad. I was crusty, twitchy, snide, and more callous than I recall. But worse than that, I was stupid. I wrote lightweight stuff without much depth, with high-school sophistication and obvious failures of logic. My ideas were thin gruel. I let dopey things like extremist feminist and environmental rants make me livid. I was clearly insecure, angry, and, well, young. At least being young isn't a problem anymore. I've actually enjoyed being 50. I know what I'm good at and don't have to prove anything to anybody these days. I can see all sides of an argument, and not only suffer fools gladly but even learn from them on occasionand offer them the same favor in return. Is this what they mean when they talk about the "wisdom of middle age?" And if so, can I enjoy it for awhile? After drifting back into carb country over the past year (and, interestingly, watching our weights creep up in the process) Carol read somewhere that lowering your carbohydrate intake can ameliorate migraines, which have particularly bad for her this year. So we cut back on carbs again, her to dampen the headaches, and me so that we're not cooking two separate meals for the two of us. She's dropped carbs more radically than I have, and she still has someabout 10 grams per meal, typically. After two weeks, her headaches seem to be in retreat. We've both lost some weight; in fact, I lost a pound a day for several days. We're feeling better, sleeping better, and nothing seems amiss. I'm now convinced more than ever that we as a nation are fat because our own government and medical community has convinced us that eating fat makes us fat, and that we should gorge on grains. (Check out the little "food pyramid" on the label of anything with grains in it. 11 servings of grains per day! 11!) Anyone who challenges the dogma is branded a nut. Here's another essay on the subject. Maybe it doesn't work for everybody. Another health myth is that all racial and ethnic types prosper on the same diets. We recently got a newsletter from the normally sensible Mayo Clinic describing an "Asian diet" that waswhat else?heavy on grains. No indication came with it as to whether anyone has ever done long-term dietary studies on Asians versus northern Europeans, or any other group, in terms of metabolic function and different types of foods. I'll freely grant that Asians may do well on a grain-heavy diet. Why does that imply that any other ethnic subgroup will? Where is the "science" in "medical science?" Well, the election's over and I'm no longer getting fifteen or twenty tape recorded phone calls per day begging me to vote for one fool or another. The Democrats are wringing their hands and asking, How is this possible!?!? The President's party always loses ground in the midterm elections! Well, I'm puzzled tooeverything I read in the press and online pointed in the other direction. I will hazard a theory, however: I think Jewish-Americans spanked the Democrats for failing to stem or even recognize the increasingly shrill anti-semitism among key Democratic constituencies. Chief among these are the universities, where if you listen a little you'd think Hitler had risen again and moved to Tel Aviv. But I'm struck every time I read some generally liberal journal or Web site, that swipes at Israel are all over the place, and the Palestinians have been elected the new victims-of-the-month. This is, of course, the professors' right. I just hope they understand the possible consequences. If American liberalism becomes reliably anti-Israel, the Jews will bolt, and may even start voting Republican. Or maybe not. But in our surgically bisected nation, losing even a portion of a longtime constituency can put you in the other party's dust. Your erstwhile supporters don't have to vote for the "bad guys." They just have to stay home. I think that's what happened here, and I'm watching the post-election analysis for somebody to raise this as a possibility, and perhaps do some research to support it. I got all excited when I found The German Candy Shop, because it looked liked a place that sold our beloved Katzen Pfotchen (cat's paws) for about half of what Licorice International charges. (When I find something we like that much, I always look for second sources.) Then I realized that it cost at least $30 in shipping to order anything, since the shop is in Germany and the goods have to cross half the planet to get here. We'd probably be ahead if we ordered 20 bags or so, but that's a lot of licorice. Moral: Read the fine print before you get too excited. There's usually a catch. I can't find my copy of John Hick's book, Death and Eternal Life (and Amazon has no cover shot) but I'll mention his most-interesting take on reincarnation: That we are indeed reincarnated after death, but reincarnated intact, as the person each of us is, with memories and personalities present and functional. The trick of course, is that we are not reincarnated here. Hick postulates additional human worlds, into which we are born or somehow remade, at each waystation learning a little more and becoming more perfectly ourselves, whatever that means. Because he is a Christian (though admittedly one out there on the fringes) he sees the process as proceeding toward a destiny: The Last Day, when all who have ever been born have had the dirty water wrung out of them sufficiently to allow final reunion with the Divine. We bring what wisdom we accrue in each world to the next, so as our incarnations proceed the worlds we inhabit become less random and violent and more just and equitable. Evil falls away as we go, so by the time we return to God there's none left. I don't remember a great deal more than that; the book is quite dense and it was a struggle to get through it. Christ has a role in the process, in that his Resurrection here on Earth became the model for our many personal resurrections to come on all those ineffable worlds that await us, and without that model and the Divine Will to make it all happen, we'd be stuck, soulless and despairing, in the mire of our own Earth-bound collective unconscious. Again, as with conventional reincarnation, I'm not buying into it, but it's a fascinating twist on a very old notion. The book was a painful read, but if you're into metaphysics there's nothing else like it. While browsing the (increasingly sparse) VHS racks at Blockbuster loking for something new and diverting to walk to, I did a double-take over Dinotopia. They made a movie out of that and I didn't hear about it? Yesbecause it was a TV mini-series made for the Hallmark Channel, which (like everything that comes on cable) we don't get here. A double-tape, too. 240 minutes; yup, that'll last me most of the week that the rental gives me. I read one of the Dinotopia books years ago, and was impressed by the baroque artwork far more than the so-so storyline: A small plane crashes in the Atlantic, and two half-brothers wash ashore on a large and very strange island where the dinosaurs are as smart as we are (if not always as agile) and talk, too. Humans live there too, mostly descendents of those washed up on its beaches after shipwrecks on the Razor Reef. Dinotopian society (as its name implies) is peaceful and socialistic and idyllic, except when the T-Rex herds get rowdy and start trashing villages, or when modern American teenagers land and start acting like...modern American teenagers. Silly, sillybut visually sumptuous. The backdrops are gorgeous, and the CG dinos are the equal of anything we saw in the Jurassic Park flicks. There are tons of dinos, and they're on-screen almost all the time, especially the fussbudget saurian librarian Zippo, who reminded me powerfully of C3PO. And Waterfall City was simply astonishing; I didn't know you could make CG waterfalls look that real. I'm glad I sat (walked?) through all 240 minutes, mostly for sake of the scenery and the surprising pleasure of an adventure told at something like leisure. Of course, you can't look too close. The plots are full of holes and there are so many loose ends left untied that I knew (well, ok, I knew) that this was the lead-in for a regular TV series. The characters were mostly fingernails-on-a-blackboard, especially the blowhard mayor and the bratty, completely hateful punk Carl. I wonder if the film's producers even recognized the message they were putting across: That girls will take their clothes off for a good-looking boy, even if that boy slacks off, lies, cheats on exams, steals the power source from a dino nursery, and insults everyone in sight, whereas an ordinary-looking boy who works hard at dino school, confronts and defeats his fears, and tries to learn to become a model citizen doesn't even merit a peck on the cheek. Maybe that's real life, hehbut I'd just as soon not be validating it by showing it to kids on the big or little screen. Rent it if you can get it cheap, for the dinosaurs and Waterfall City. Good monsters. Dumb characters. Great waterfalls. Ok, I'm easy to please. See it anyway. Well-known SF writer Charles Sheffield died this morning, of a brain tumor. I had only met Charles once, at his wedding to Nancy Kress, herself a major force in SF and fantasy. Nancy was my SF mentor years ago when we lived in Rochester, NY, and we collaborated on a novelette called "Borovsky's Hollow Woman" that appeared in Omni in October 1983. Death was uncommon in my life for many years, and people of my acquaintence who died were memorable strictly because of their rarity: College friend Sharon Bloom was murdered in 1985, and Bill Nixon, a Rochester fireman who (like me) had an Intersystems DPS-1 machine, died on the job in 1982. Joanne Struczewski, with whom I worked at Xerox in the early 80's, died in 1995. Somewhere along the way (typically in your 40's) the rate picks up a little, and keeps picking up the longer you go on. In just the past three years I've lost several relatives and some friends: my mother, my aunt and godmother Kathleen Duntemann, my confirmation sponsor Joe Toczyl, SF insider Ross Pavlac, Keith Weiskamp's wife Ruth Greif, Coriolis editor and friend Sherri Chicketti, and in the past few weeks alone, Jim Seymour of Ziff-Davis, who offered me a job after Borland laid me off in 1988, and now Charles Sheffield. One might be forgiven for thinking that the fates are sneaking up on me, but, my friends, that's how it works. As we age, our friends age too, and soon we're hurtling up the side of mortality's bell curve. Yes, I'm healthy, and doing everything I can to remain so, but every once in a while, well, I just find myself looking over my shoulder. In recent days I've been emptying out boxes stored in the garage, boxes full of stuff that has been following me around for a lot of years. I had a little software company from 1981-1984, and Carol and I spent a weird hour shredding checks and things and remembering how odd it was to sell 8" CP/M-80 disks in plastic bags, sometimes for as much as $200. And I found my "engineering notebook" for my robot Cosmo Klein, who was featured (along with Carol and me) in an article on robots in Look Magazine in 1980. (I was only 27 when the photo was taken, and still had most of my hairthough my choice in sweaters was questionable.) Cosmo was COSMAC powered, with two whole computers on board, one for his various motors and another to display his animated video face. RCA's COSMAC microprocessor was a fine little CPU. (See this site for more info; most people think "COSMAC ELF" since the Elf was the computer that put the COSMAC architecture on the map.) Extremely orthagonal instruction set, based around a suite of 16 completely undedicated 16-bit registers, each of which could act as instruction counter, stack pointer, scratch memory, and several other things. It didn't go very quickly, with a top clock speed of 3.579 MHz (color burst frequency, ideal for use in video games) and a bad habit of taking 16 clocks to execute most of its instructions, even simple ones. But I could write substantial pieces of code in pure binary, in my head, which was good, because I had no operating system, no mass storage (well, close: I had a paper tape reader and encoded tapes on a PDP-11 system at Loyola University) and no assemblers or, lord knows, high level languages. In reading through the beautifully executed COSMAC programming manual published by RCA, I realized how much I missed embedded systems work. I have a printout of a piece of PIC assembly language written by a friend of mine, and it all looks eerily familiar, not because the CPUs resemble one another, but simply because it was assembly that "did things" mostly by executing timing loops and writing values to I/O port registers. I really want to get back to that. I'm sure it's easier todaywe can run our assemblers on our PCs and slurp down the code through USB linksand there are some interesting gadgets I'd like to build. More on this in the future, as I finish off my Wi-Fi book and move on to new projects.